In today’s dynamic business environment, it is becoming increasingly incumbent on the finance function to demonstrate value it adds to the company’s value creation and conservation decision. The question is “how has your finance function performed these roles?” This is the main challenge of Cambodian companies. The following diagram is the summary of Finance Functions’ roles in value creation and conservation. A comprehensive diagnostic of your finance functions to identify key issues and improvement priorities to align with company strategy and management requirements. PCG has developed a Finance Function Assessment Tool for this service. This tool is built around the roles of Finance Function and its enabling factors (process, people & systems). In addition, this tool is based on the system approach that can be tailored to different nature and size of the company. 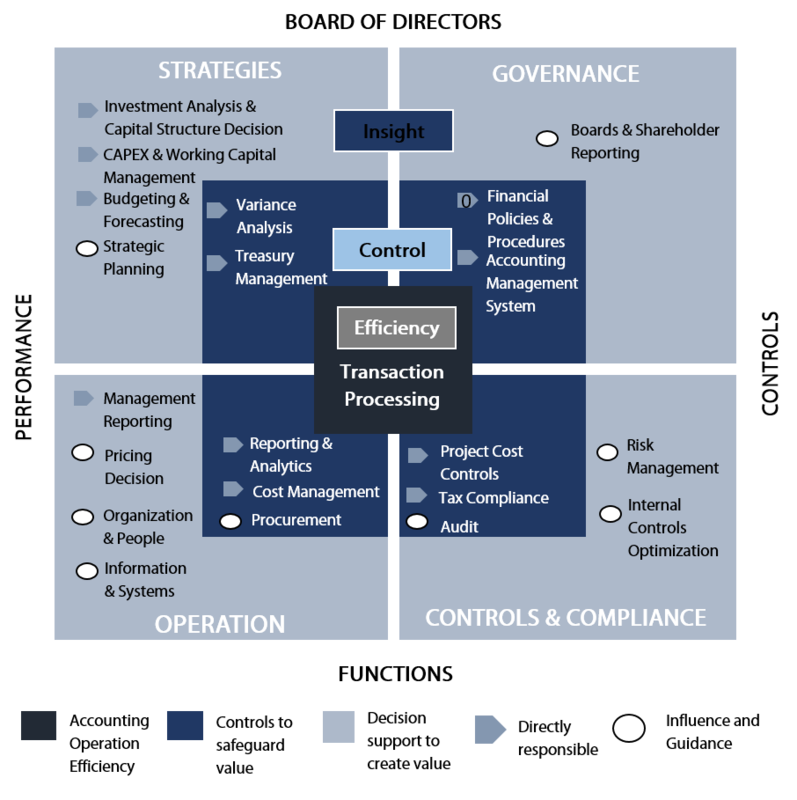 Standard Financial Operating Procedures Development: Improving designs and core processes to optimize speed, accuracy, efficiency and adaptability across the finance function. In addition, to achieve cost saving through alignment of finance processes and removal of inefficiencies. Accounting System Design: Improving the speed, accountability, transparency, control, consistency, and quality of financial reporting process chain by entirely redesigning or fining-tune the existing account information system. Facilitating the conversion to Cambodia International Financial Reporting Standards (CIFRS) or CIFRS for SMEs. Development and/or implementation support of finance systems strategies. Managing the business: Cash Flow Modelling, Capital Expenditure and working capital review, Budgeting, Forecasting and management reporting, and KPIs development. Strategic Decisions: Strategic options analysis, scenario analyse, Model review, product/ service cost & profitability, pricing analysis, KPIs development and cost analysis. Shaping the Business: Sensitivity analysis, valuation, acquisitions, disposal, and joint ventures. Focusing on critical success factors and measure quality and reliability of historical and forecasted financial performance. Providing extensive experience and comprehensive tools to fine tune your working capital performance, by sustainably decrease working capital, improve liquidity and improve return on capital employed. There are three aspect of this work, which are (1) transforming resilient system, processes and policies, (2) optimizing performance measurement and compliance, and (3) improving forecasting and monitoring cash flow.